Oh, dear. Recently I was lamenting the fact that I'd dipped on Black-eared Catbirds after four trips to Iron Range - two of which had the sole purpose of looking for catbirds. 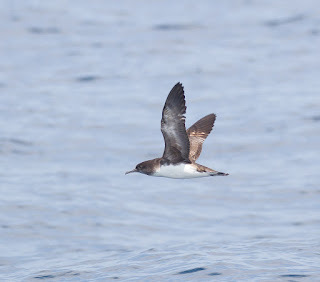 Now I am bemoaning the fact that I've dipped on White-necked Petrels. Again. 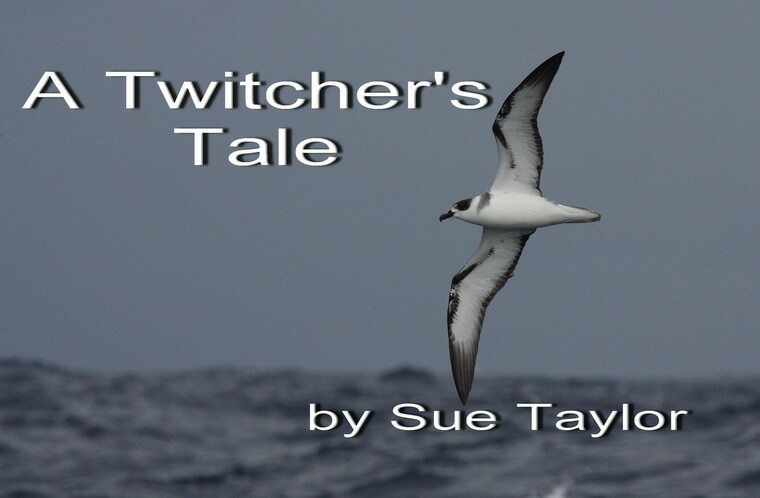 I have looked for White-necked Petrels every summer since 2008. I've been to Wollongong on six occasions, Port Stephens twice, Southport twice and this was my third trip to Kiama. In addition to this, four boat trips I've booked on for the sole purpose of admiring White-necked Petrels, have been cancelled. We had a pleasant day out of Kiama on Saturday 27 January 2018. The weather was perfect, the sea was calm, the company was great, but there were no exciting birds. For me, the best bird of the trip was the bulbul I saw sitting on electricity wires on the way to the boat. A White-tailed Tropicbird was probably the most unusual sighting we had. It flew low over the boat, giving good views. The only jaegers we saw were Pomarines, and I think there were about half a dozen of them. 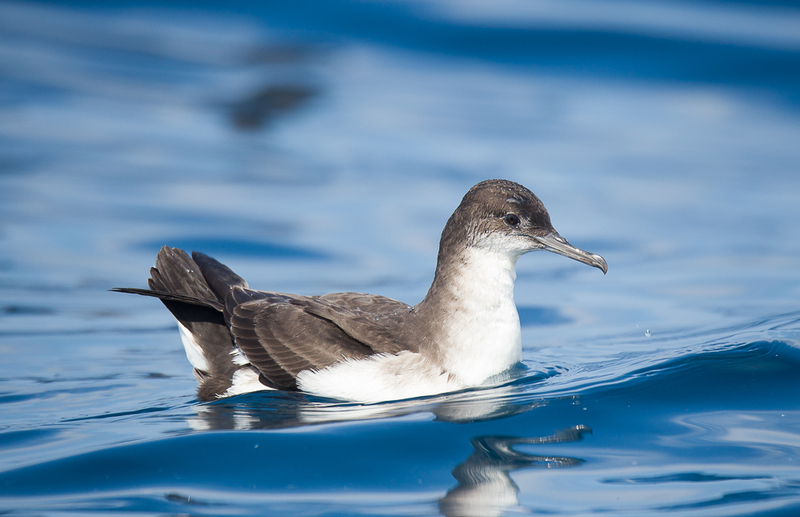 We saw six species of shearwater: the most common was Wedge-tailed, then Flesh-footed, with just one or two Short-tailed and Sooty. We had exceptionally good views of both Fluttering and Hutton's and what was most unusual was they were close enough even for me to tell the difference. 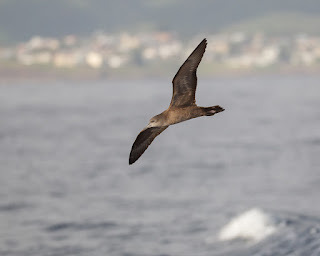 Naturally, a White-necked Petrel was seen out of Southport the day after I didn't see one out of Kiama. All I can do is keep my fingers crossed for February. WILL I EVER SEE A BLACK-EARED CATBIRD? I have just returned from my fourth trip to Iron Range. On this occasion (as on the last) I had just one aim: to see a Black-eared Catbird. Before I signed up for the trip, I asked about catbirds and was assured that there was a good chance of seeing one. We spent three nights at Lockhart River, and in that time we heard three catbird calls. Each was a single call. None was repeated. Looking back, I don't believe that there ever was a reasonable chance of seeing a catbird. Iron Range is on the north of Cape York. It is a long way from Melbourne. To get there, I fly to Cairns, then fly in a Dash 8 to Lockhart River, which takes 1 hour 40 minutes from Cairns. My first trip to Iron Range was in June 2008 with Klaus. We saw Green-backed Honeyeaters, Eclectus and Red-cheeked Parrots. Also the northern races of Double-eyed Fig-Parrots (male with red on his face) and Red-browed Finches (with brighter colours). We saw a Chestnut-breasted Cuckoo at Cook's Hut and several Papuan Frogmouths (with red eyes) and Marbled Frogmouths (with orange eyes). We stayed at a house in Portland Roads and came home one night to a Large-tailed Nightjar sitting on our driveway. Klaus did a good job and we saw all the birds we'd hoped to see. I thought I would never need to return to Iron Range. In September 2015, with Richard Baxter, I stopped briefly at Portland Roads on the way to Raine Island (to see the Herald Petrel). 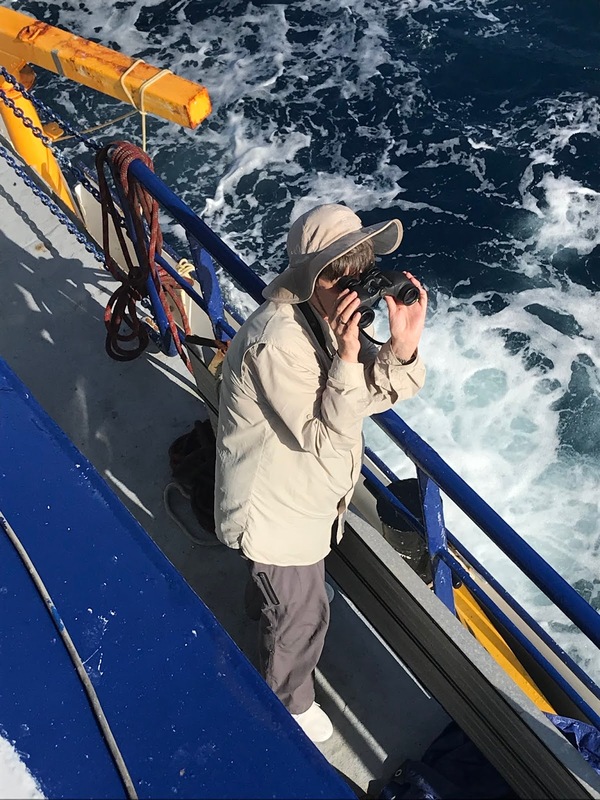 Again, we admired Double-eyed Fig-Parrots at close quarters, but we had little time for birding and hurried to catch our boat. Then came the catbird split and I had to return to Iron Range to see the Black-eared Catbird, now given full species status. In July 2017, I visited with Phil Maher. We had four nights at the Lockhart River cabins and saw 77 species of birds. Alas! the Black-eared Catbird was not one of them. After that, I did not want to go all the way to Iron Range and again miss out on my catbird. Chook Crawford was running a tour in January 2018, arriving on Friday 12 January and leaving on Monday 15 January. I quizzed him about catbirds and he said there was 'a good chance' of seeing one. There were 14 of us on the tour, as well as Chook and his wife, Tracey. I think 14 is too many for one guide with one scope. Having said that, I believe everyone on the tour was quite satisfied with the birds we saw. Everyone that is, except me! We all saw Red-bellied Pittas, Northern Scrub-robins, Eclectus and Red-cheeked Parrots, Palm Cockatoos and White-streaked Honeyeaters. And we had great views of Black-winged Monarchs. For the first two days, I had vicarious pleasure in others getting life ticks. Then, when I realized that I was not going to see my catbird, the pleasure waned. We were lucky that it didn't rain, but the weather was hot and sticky and uncomfortable. We did a lot of bush bashing for the pittas, something I never enjoy. They were a good bunch of people and it was great to see some very beautiful birds. However, I went to see a catbird and in this I failed dismally. 2018 is not starting off well for me. While in New Guinea waters, we saw a Beck's Petrel. This filled us all with enthusiasm. What wonderful birds there were here! What great sightings we were going to have! We left on Wednesday and arrived in Australian waters on Thursday. On this memorable day we thought we saw four rarities. As it turned out there were only three and they were the only rarities of the trip for most of us. On Saturday, Damien saw a Band-rumped Storm Petrel. Unfortunately no one else did. I was standing right beside him and couldn't see the bird. This is a comment as much about my eyesight as about how difficult it was to see the bird. Generally, all birds were difficult to see on this trip. This does sound very exciting - and it was - but it didn't last long. We all went to bed on Wednesday night thinking we'd all come home with extraordinary, incredible birdlists. Little did we know, that was it. There would be nothing else to add to our lifelists. Most of the trip had very, very few birds. Nothing was attracted to our berley. We did not have good views of most birds. The Red-footed Boobies that roosted on our mast were one exception, and we saw thousands of Wedge-tailed Shearwaters, but most birds were (for me) just dots on the horizon. But mainly, it was just the horizon. I did not enjoy the trip. I was ill. Richard was ill. Hedley was ill. The sea was rough. We weren't seasick, we had some virus I believe. At least this meant that, when I wasn't fed, I wasn't so hungry. I had a cabin to myself. Down a steep ladder. On the first night an intruder entered my cabin. Whoever it was did not answer my questions and did not obey my demand that he or she leave. Perhaps he or she didn't speak English. My room was a store room full of towels. This intruder calmly helped itself to an armful of towels, then left in its own good time. I locked the door thereafter and had no more problems. But I never felt quite easy after that. Hedley and Irena had a dodgy door handle, which came off in their hands, leaving them locked inside their room. Mike and James' room leaked when it rained. I didn't like the boat at all. We were buzzed by the Border Force a couple of times and they contacted the ship to check up on us. They asked the second mate to spell the name of the ship, but he found that spelling the name 'Surveyor' was quite beyond him. We stifled our laughter. One interesting phenomenon we came across was a yellow substance in the water. Glen gathered some in a bucket, but closer examination didn't help to identify it at all. He suggested it might be coral spawn. Some fish were caught, but watching them being dispatched was not a vegetarian's delight. 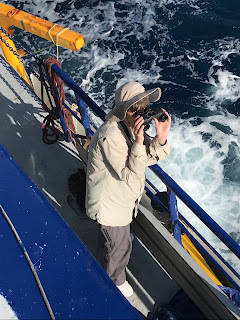 When it was apparent that we could not make the seamounts we were headed for, we turned back, hoping that we'd come across the large flocks of feeding birds we'd seen on the way. 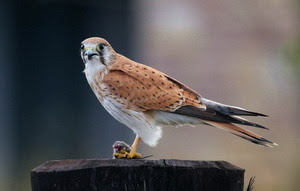 Perhaps with another rarity, or even better views of the same rarities. It was not to be. Usually when I return home with a tick or two under my belt, I feel pretty pleased with myself. Not on this occasion. This trip was a mistake.